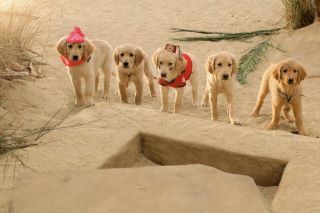 Oh how we love the Buddies! My son adores these cute and adventurous pups. 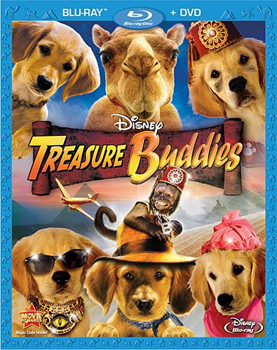 We have seen all the Buddies movies and Treasure Buddies is as good as the rest. As a lover of archeology and a fascination with ancient Egypt I thought this was a cool movie too. It was a fun movie to watch with my son. The story line was simple enough for kids and kept adults interested as well. The story is about the Buddies traveling to Egypt to stop an evil cat from trying to find the ancient cats eye necklace that will band dogs from being mans best friend. The movie is a a cute dog vs cats with the story about a cat's desire for power. Canine superstars Rosebud, B-Dawg, Budderball, Buddha and Mudbud, as the pup pack journeys to mysterious Egypt in search of the greatest treasure known to animalkind, the legendary Cat’s Eye jewel, from the lost treasure of Cleocatra! Danger lurks around every secret sphinx, cryptic crypt and puzzling pyramid as Ubasti, a devious cat, schemes to possess the mystical jewel and use its powerful energy to rid the planet of all dogs! With help from new lovable friends Cammy, a baby camel - and a mischievous monkey named Babi - the gang and their new friends avoid booby traps, solve puzzles and explore a mysterious tomb in their most exciting and challenging adventure yet. We are fans of the Disney Buddies on facebook so we can stay up to date on all the latest Buddies news. You can play some fun games on the Treasure Buddies website including a decoder game with Egyptian hieroglyphics.